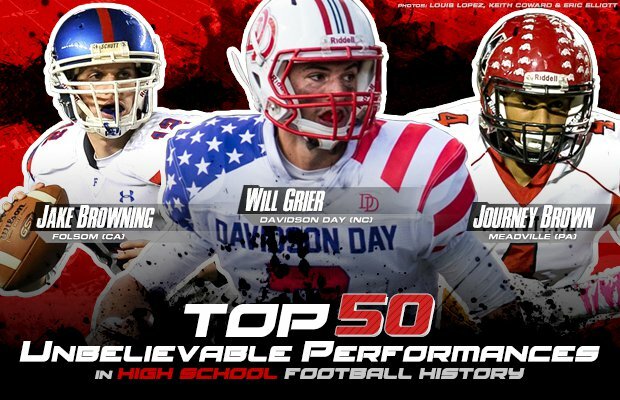 Will Grier, Journey Brown among the greatest high school performers of all-time. See the Davidson Day quarterback have a day in a 104-80 win. The 2018 season has seen some of the most explosive individual statistical performances, ranging from Peyton Bevel's 789 yards and 12 touchdowns to Joshua Jones 617 yards rushing and nine touchdowns. Which raises the question: What is the great individual performance in high school football history? Taking into account the player's statistical performance, along with the importance of the game, the final score and the uniqueness of the event, MaxPreps has put together the Top 50 unbelievable performances in high school football history. Stat Line: 35 completions in 42 attempts, 837 yards, 10 touchdowns; six carries, 45 yards, two touchdowns. Notes: In one of the highest-scoring games ever, Davidson Day defeated Harrells Christian Academy 104-80 in the NCISAA Division I semifinals. Grier, who was named Parade Magazine National Player of the Year in 2013, set a national record for passing yards in a game, along with total yardage at 882 yards. He also threw a national record 99-yard pass and had accounted for 12 touchdowns. However, none of the marks are part of the National Federation of High Schools record book because Davidson Day is not a member of a state association. Stat Line: 29 carries, 722 yards, 10 touchdowns, four 2-point conversions, 68 points. Notes: Brown had the second-highest rushing total in high school history, but it came in a game that was back-and-forth throughout and produced one of the highest scoring games in high school history. Brown led Meadville to a 107-90 win over DuBois with touchdown runs of 76, 49, 1, 58, 25, 65, 18, 47, 93 and 66 yards. He had 498 yards on touchdown runs alone. He was also part of an offense that set a national record for rushing yardage with 1,004 yards. Stat Line: 15 touchdown passes, 10 rushing touchdowns. Notes: Not a lot is known about Smith's performance except that his team scored 35 touchdowns in one of the most lopsided wins in high school history — a 201-7 win over Overton. While most reports list Smith with the 15 touchdown passes, fewer reports list Smith's 10 rushing touchdowns. Ironically, Cozad lost to North Platte 176-0 early in the season, but then beat Farnham 174-0 a couple of weeks later. Stat Line: 754 yards rushing, eight touchdowns, six conversions, 54 points. Notes: There is some confusion about Giannantonio's performance. Doug Huff, in his national high school football record book, lists Giannantonio's effort at 754 yards against Mountain Lakes in a 61-0 win in October. Chuck Langerman, a New Jersey journalist and historian, lists the effort at 739 yards in a Nov. 24 66-6 win over Clinton (later renamed Hunterdon Regional). Additionally, the yardage total was not reported as a national record until nearly 40 years after it happened. Stat Line: 31-of-55 passing for 787 yards and 10 touchdowns, also had one rushing touchdown. Notes: At the time, Miller's yardage total ranked No. 1 by the National Federation of High Schools record book. The performance came in Miller's first start at the varsity level. A sophomore, Miller missed the first game of the season due to an injury. Stat Line: 34 completions in 51 attempts, 689 yards, 10 touchdowns. Notes: Browning was in a battle for the starting spot for the Bulldogs during the 2012 preseason to see who would replace record-setting quarterback Tanner Trosin, who had graduated. When the other candidate quit the team, Browning stepped in and history was made. 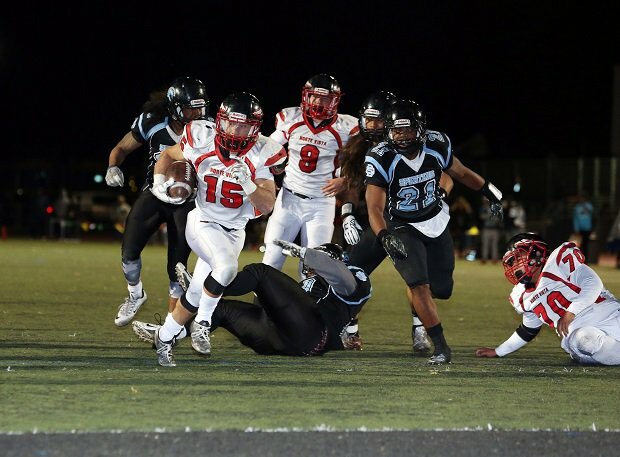 He led Folsom to a 68-28 win over Woodcreek with the 689-yard effort. By the time his career was over, Browning owned the all-time yardage mark in California with 16,775 yards. Stat Line: Eight touchdowns scored, six on punt returns, seven extra points. Notes: The eight touchdowns is a side note to the unique way that Golson scored six of his touchdowns — all on punt returns. His returns were 75, 75, 75, 50, 65 and 90 yards long. He also had touchdown catches of 35 and 50 yards in a 61-13 win over Loretto. Stat Line: 39 completions in 59 attempts, seven touchdowns. Notes: Koral became the first quarterback to throw for over 700 yards in a game when Palisades defeated Grant 48-30. Koral, who had 10 touchdown passes in a different game in 2000, threw touchdown passes of 80, 15, 42, 52, 94, 90 and 34 yards. He beat the previous record by 92 yards. Stat Line: 43 completions in 60 attempts, 594 yards, 10 touchdowns. Notes: House became the first quarterback to throw for 10 touchdowns in a playoff game as he helped Nitro defeat Morgantown 69-52 in the West Virginia Class AAA championship game. The contest was the last game of House's career and left him as the nation's all-time yardage leader with 14,457 yards. Notes: Huston's name appears multiple times in the national record book, but his performance against Parkview in a 69-58 win topped them all. Huston broke the completions record by nearly 20 and he tied the attempts mark of 87. His 822 yards were just 15 off the unofficial national record and it established a national record, according to the NFHS record book. He also threw for nine touchdowns for the fourth time in his career. Stat Line: 14 touchdowns, 14 extra points, 98 total points. Notes: Cook's effort in a 128-0 win over Tarkio (Mo.) is mentioned only briefly in Nebraska newspapers of that time, possibly because 100-point games were not necessarily a rarity of the day and because statistics other than touchdowns were not generally kept. Cook's total was not mentioned in earlier versions of the NFHS record book. Stat Line: 14 touchdowns, 14 extra points. Notes: Very little is known about this performance, which came in a 142-0 win over Lehigh. Roff no longer plays football and according to former Oklahoma City Oklahoman sports writer Ray Soldan, the details of the game are nonexistent. It reportedly appeared in Ripley's Believe it or Not and details of the game generally come from an interview with Matthews, who was a longtime coach in Oklahoma and one of the winningest basketball coaches in state history. Stat Line: 36 carries, 659 yards, nine touchdowns, one 2-point conversion. Notes: Wood set the Kansas single-game rushing record in an 84-56 win over Chaparral and replaced Thomas Tyner as the No. 3 all-time single game rushing performance in national history. He also holds the national record for most rushing yards in a game by a quarterback. Stat Line: 38 carries, 644 yards, 10 touchdowns. Notes: On his 18th birthday, Tyner set an Oregon state record with his yardage total that ranked No. 3 all-time in national history at the time. He scored on runs of 20, 41, 62, 60, 65, 48, 41, 40, 34 and 10 yards. Notes: Hall played in the days of segregation in Florida and is generally recognized as one of the great running backs in Florida history. In a 108-0 win over Live Oak, Hall, known as "Boogie", rushed for 12 touchdowns. Just to show that effort wasn't a fluke, he scored 10 touchdowns the following week. Stat Line: 520 yards, 11 carries, eight touchdowns. Notes: Since John Giannantonio's 754 (739?) yard rushing performance was unknown at the time, Hall's 520-yard effort on just 11 carries in a 73-14 win over Houston Lutheran stood as the national record for rushing yardage in a game for nearly 20 years. Hall gained almost all the yardage in the first half and barely played in the second half. He went on to set national records for career points (899) and career rushing yardage (11,232). Stat Line: 10 carries, nine touchdowns, three extra points, 57 overall points. Notes: One of the most highly recruited players in the nation in the late 1930s, DeCorrevont was featured in Ripley's Believe it or Not after his performance in a 93-0 win over McKinley. He touched the ball just 10 times in two quarters of play and scored nine touchdowns. He helped lead Austin (now defunct) to the national championship in 1937, as determined by the National Sports News Service. Stat Line: 13 touchdowns, 10 extra points, 88 points. Notes: The leading scorer in the area prior to Salem's 188-0 win over Fairfield, Wile put the lead out of reach with his 13-touchdown effort. His 88 points are recognized by the NFHS record book as the third-highest total ever, however his 13 touchdowns are not listed in the record book for unknown reasons. Stat Line: 28 carries, 661 yards, 10 touchdowns. Notes: At the time, McCoy's performance was believed to be a national record, eclipsing the posted mark of 619 yards by Ronney Jenkins. However, Doug Huff noted that he had John Giannantonio of Netcong (N.J.) with 754 yards (or 739, the exact number has changed), in his National High School Football Record Book (released 2001). The NFHS record book did not have Giannantonio's mark (it now does), resulting in the confusion. In the 64-0 win over Burch, McCoy had touchdown runs of 69, 1, 53, 56, 52, 20, 31, 84, 87, and 25 yards. Stat Line: 19 receptions, 312 yards, five touchdowns. Notes: Martinez's performance might not seem overly impressive until it's understood that his team did not play a second half in a 63-0 win over Los Angeles Lincoln. The Railsplitters left at halftime. The receiver for All-American quarterback Ron Cuccia, Martinez might have easily broken the state record of 323 yards in the second half. His touchdown total tied a state record at the time and he might have easily broken his own state record of 24 receptions (set earlier in the year). Stat Line: 13 touchdowns, 14 extra points, 90 points. Notes: In the most lopsided game in high school history, Haven defeated Sylvia 256-0. McCoy scored 90 of the team's points, while teammate Jesse Atkinson scored 60 of his own. McCoy's point total was considered the national record for some time, until the 14-touchdown totals of John Cook and Leroy Matthews came to light. Haven benefited from Sylvia kicking off after Haven had scored five times. All five kickoffs led to kickoff returns for touchdowns. Stat Line: 21 completions, 33 attempts, 789 yards, 12 touchdowns. Notes: Bevel set two state records in a 90-62 win over DeLeon as his 789 yards ranks No. 1 in state history and No. 3 all-time in national history. 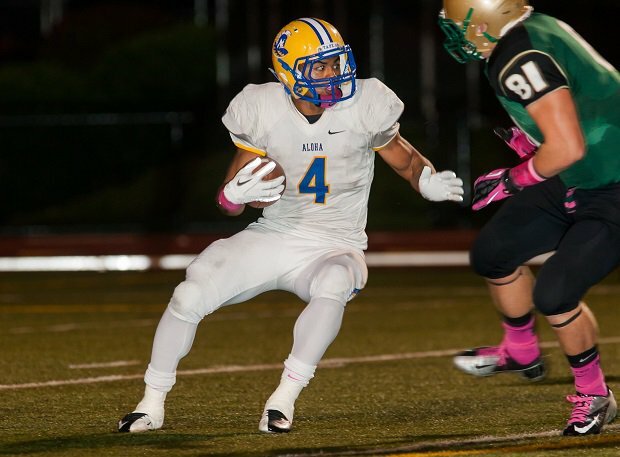 Additionally, his 12 touchdowns are a state record and ranks No. 2 nationally. Stat Line: 11 touchdowns, 14 extra points, 80 points. Notes: In a 108-0 win over Sweetwater, Greene set the California state record that still stands today, according to Cal-Hi Sports. Greene went on to play in the NFL, but eventually became a police officer. He was killed in the line of duty in 1954. Stat Line: 36 of 45 for 757 yards, six touchdowns, 34 yards rushing, three touchdowns. Notes: In a state that has produced many prolific passers, Hatcher's performance ranks No. 1 all-time. It helped Hatcher set a state record for the season with 5,779 yards. He ranks sixth all-time with a state record 15,483 yards. Stat Line: 11 touchdowns, 10 extra points, 430 yards rushing. Notes: In a 103-12 win over Sunbright, Byrge set the Tennessee state record for touchdowns and points. No high school player has scored more points than Byrge since 1968. Notes: For many years Pearson's touchdown total was thought to be the national record. Further research showed that two other players scored 14 touchdowns and yet another had 13. Pearson's total came in the third of three 100-point outings for Hugo, which beat Burlington 104-0, Flagler 106-0 and Vona 176-6. Notes: Cummings tied the state record for touchdowns, set two years earlier by Willie Hall, in an 83-13 win over St. James (later to become Bishop Moore). Cummings had kickoff returns of 85 and 70 yards and also had two scoring runs of 40 yards and two more for 35 yards each. Stat Line: 30 carries, 619 yards, seven touchdowns. Notes: Jenkins scored on a 93-yard run on his first carry of the game and scored on a 15-yard run on his last carry in a 52-34 win over Rio Mesa. At the time, Jenkins' total was considered a national record, since Giannantonio's mark had not been included in the NFHS record book. Stat Line: 12 touchdowns, six conversions, 78 points. Notes: One of the top Ohio athletes in the 1920s, Simmons set a state record that still stands today with 12 touchdowns and 78 points in a 159-6 win over Spencer. Simmons, known as "Tunk", finished his career with 362 points. Stat Line: 43 carries for 563 yards, eight touchdowns. Notes: While many of the top rushing performances occurred during the regular season, Melesio's effort happened in a playoff game, a 62-56 win over St. Margaret's. Melesio scored the game-winner on a 72-yard run. He finished the season as the nation's leading rusher with 4,459 yards and 56 touchdowns. Stat Line: 38 carries, 410 yards, 11 touchdowns, six extra points, 72 points. Notes: Two years before making his Major League Baseball debut with the Cincinnati Reds, Gullett set a Kentucky state record with 11 touchdowns in a win over Wurtland, where Gullett had previously gone to school. Stat Line: 39 completions, 51 attempts, 659 yards, eight touchdowns. Notes: In a 59-42 win over St. Cloud, Israel set the Florida state record for single game yardage with 659. 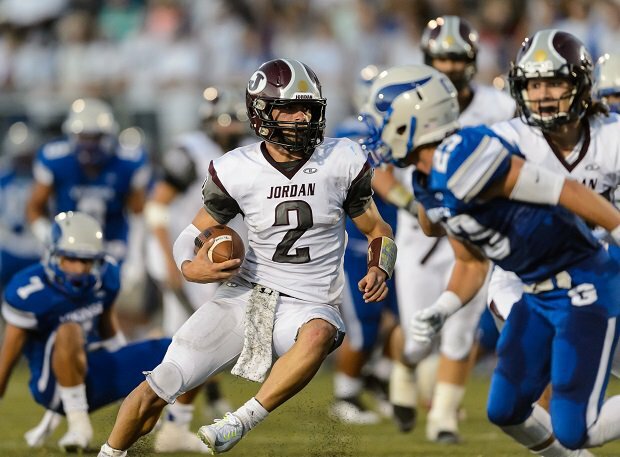 A week later, he posted the second-best passing yardage performance in state history with 630 yards in a 73-22 win over Celebration that included nine touchdown passes. Israel became the first high school quarterback to throw for over 600 yards in back-to-back games. Notes: Johnson broke the previous national record by two scores with his eight-touchdown performance in a 67-38 win over Ste. Genevieve. He had touchdown catches of 14, 6, 50, 24, 8, 44, 6 and 24 yards. Notes: Prior to Arthur Smith's 15-touchdown performance for Cozad against Overton, Cozad lost 176-0 to North Platte, which was led by Locke. One of the fastest sprinters in the world in the early 1920s, Locke had "at least" 12 touchdowns in the Cozad win, according to the Nebraska Hall of Fame. He eventually set the world record in the 100 meters while at the University of Nebraska. Stat Line: Nine field goals, three extra points. Notes: Earlier in the year, Bluffton had defeated May River 77-3. In the rematch, Bluffton kicked mostly field goals in a 50-0 win and Chappelear was the beneficiary. He scored on kicks of 47, 32, 30, 26, 33, 35, 36, 44, and 28 yards. His three extra points gave him a national record for kicking points in a game with 30. Stat Line: 38 completions, 76 attempts, 756 yards, 10 touchdowns. Notes: Not even the team's quarterback as a junior (he played receiver), Armendarez set state records for passing yardage and touchdowns, albeit in a 96-70 loss to Agua Fria. He also rushed for 68 yards, giving him 824 yards of total yardage. Stat Line: 38 carries, 608 yards, five touchdowns. Notes: Bunch set the Arkansas state record the week before with a 441-yard outing. He broke the reported national record of 520 yards by Hall with the performance in a 74-0 win over Winslow. He scored on runs of 46, 17, 39, 83 and 32 yards. Also had eight other runs of 23 yards or more. Stat Line: 11 touchdowns, 18 extra points, 84 points. Notes: Grundman still holds the state record for touchdowns in a game with 11 and his 18 extra points still ranks No. 2 all-time. Stat Line: 45 completions in 87 attempts for 643 yards, six touchdowns. Notes: Hutchinson set a national record for passing attempts in leading Greenville to a 71-70 come-from-behind win over Mt. Carmel in the state playoffs. Greenville scored 22 points in the final 2 minutes, 13 seconds to secure the win. Hutchinson had a 48-yard touchdown pass and the crucial two-point conversion. Notes: Gutierrez became the first to kick nine field goals in a game, breaking a record of eight, which stood for 67 years. The kicks came from distances of 26, 29, 23, 22, 19, 19, 20, 20 and 21 according to the NFHS record book. Stat Line: 18 catches, 456 yards, four touchdowns. Notes: In the final game of the season, Pruett set a national record with 456 yards receiving. He broke the previous state record by over 100 yards. Stat Line: 10 catches, 394 yards, eight touchdowns. Notes: Rhodes equaled the national record with eight touchdown receptions in a 66-21 win over Arlington Heights. He caught TD passes of 68, 20, 53, 48, 74, 32, 41 and 29 yards. Stat Line: 37 completions, 56 attempts for 712 yards, six touchdowns. Notes: In a 73-72 playoff win over Rogers, Quintanilla came within 11 yards of setting the Texas state record for passing yards in a game by throwing for 712. Quintanilla also previously held a then-state record 10 touchdown passes in a single game. Stat Line: 16 completions, 24 attempts, 337 yards passing, four touchdowns; 37 carries, 376 yards, five touchdowns. Notes: One of the few players to ever pass for 2,500 yards and rush for over 2,500 yards in the same season, York had his best game in a 70-49 playoff win over Tyner Academy. He rushed for 376 yards and passed for 337, giving him 713 total yards. Stat Line: 29 completions, 49 attempts, 498 yards, six touchdowns; 27 carries, 196 yards, four touchdowns. Notes: While Kafentzis's Jordan team lost to Brighton 78-76 in one of the highest-scoring games in Utah history, Kafentzis put on one of the great individual performances in state history. He combined for 694 yards and 10 touchdowns in total. For his career, Kafentzis finished as the state's all-time leading passer with 13,079 yards and its all-time leading rusher with 6,942 yards. Notes: For many years, Lanier's touchdown total is regarded as the national record for touchdowns in a game. However Lanier split the touchdowns between the air and the ground. Stat Line: 27 extra points, five touchdowns. Notes: In a 172-0 win over Galva, Kelting led the offense as a fullback and a kicker. He scored five touchdowns, but he also kicked a national record 27 extra points. He made 13 in a row, missed two, and then made 14 in a row. Kelting and Moline benefitted from Galva kicking off to Moline every time that Moline scored. Kelting was 21 years old at the time he set the record, which was not an uncommon age for high school football players at the turn of the century. Notes: Long before Maris was a record-setting home run hitter with the New York Yankees, he was a football star at North Dakota powerhouse Shanley. In a 33-20 win over Devil's Lake, Maris scored all five touchdowns for Shanley, including four on returns. He returned two kickoffs for scores on runs of 88 and 90 yards, also had a 45-yard punt return and a 25-yard interception return, according to research by Bob Fulton of Pennsylvania. Maris also scored on a 32-yard run. For many years, Maris was listed with having the national record for kickoff returns for a touchdown in a single game with four. However, Fulton's research showed that Maris scored on four returns, not necessarily all kickoff returns. Stat Line: 22 completions in 25 attempts, 451 yards, 10 touchdowns. Notes: Davis was thought to have set a national record with his 10-touchdown effort in a 96-0 win over Coldwater. Arthur Smith's 15-touchdown performance was unknown at the time of Davis's effort. Davis finished his career as the nation's all-time yardage leader with 9,309 and touchdown passer with 104. Stat Line: 17 catches, 456 yards, seven touchdowns. Notes: Drew closed out the season by taking aim at two state records in a 64-41 win over Mayville. He tied the record for receiving yardage with 456 and he fell just short of the touchdown record, finishing with seven. WeNext: Is SoCal cornerback Chris Steele the next Richard Sherman?